IHOP is giving a FREE shortstack of pancakes to each guest today from 7:00am-10pm. National Pancake Day normally takes place on Shrove Tuesday; but they wanted to create some buzz and excitement prior to Shrove Tuesday. What is Shrove Tuesday? It is a day preceding Ash Wednesday, the first day of the season of fast and prayer called Lent. It is also known as pancake day because it was considered to be a last feast with ingredients such as sugar, eggs, fat which was restricted during fasting. My kids would love to eat pancakes for dinner; but don't think I want to be waiting forever in a line that I'm anticipating will be very long. 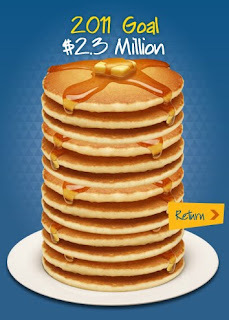 Enjoy the free pancakes for those who take advantage of this good deal and good cause. Wow, the finished product turned out beautifully...I love it!